Nanoparticles offer a promising way to deliver cancer drugs in a targeted fashion, helping to kill tumors while sparing healthy tissue. However, most nanoparticles that have been developed so far are limited to carrying only one or two drugs. The paper’s lead authors are Jonathan Barnes, a former MIT postdoc; and Peter Bruno, a former MIT graduate student. Other authors are grad students Hung Nguyen and Jenny Liu, former postdoc Longyan Liao, and Michael Hemann, an associate professor of biology and member of MIT’s Koch Institute for Integrative Cancer Research. “Performing combination chemotherapy using these new designer polymer nanoparticles is an exciting new approach to chemotherapeutics, and this polymer platform is particularly promising for its ability to carry a large load of drugs and deliver them in a triggered, controlled manner,” says Todd Emrick, a professor of polymer science and engineering at the University of Massachusetts at Amherst who was not involved in the study. Using a method developed by Hemann’s lab, the researchers then investigated how their nanoparticle drugs affect cells. 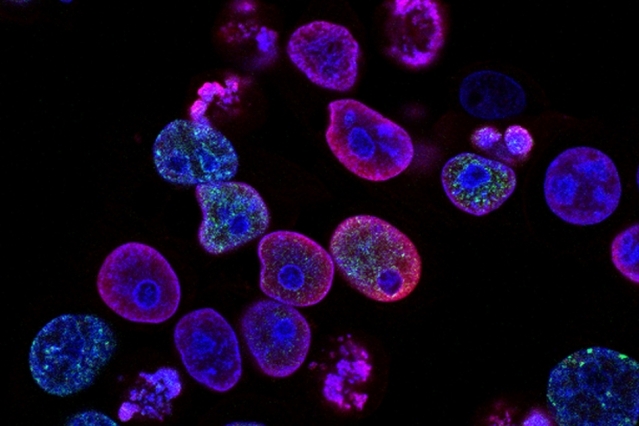 The technique measures cancer drugs’ effects on eight genes that are involved in the programmed cell death often triggered by cancer drugs. This allows scientists to classify the drugs based on which clusters of genes they affect.